Remove kale leaves from stems. Heat some olive oil in a pot over medium-high heat. Add kale leaves, season with salt and pepper, and cook for approx. 8 - 10 min. Peel avocado, remove the pit and dice half. Put the diced avocado into a liquid measuring cup with some pine nuts and remaining olive oil. Dice Parmesan cheese and add to the measuring cup. Add lemon juice and kale and use immersion blender to blend until smooth. Add more oil to loosen if needed. Dice the other half of the avocado and set aside. Heat butter in a frying pan and add gnocchi and remaining pine nuts. Fry for approx. 2 min. and deglaze with water. Continue sautéing until the water completely evaporates. Add pesto and diced avocado and stir to combine. 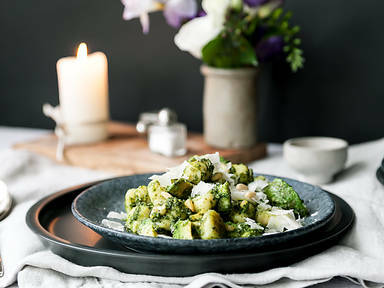 Serve gnocchi with freshly grated parmesan. Season with salt and pepper to taste and enjoy!